Naval Hq, St Peter Port. 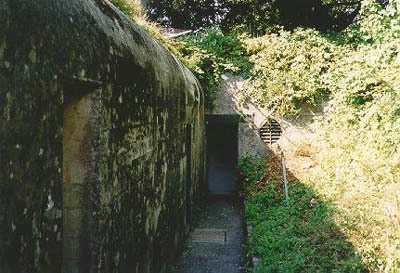 Located in St Jacques, a neighbourhood of St Peter Port, these three bunkers housed the Naval Signals Officer (Marinenachrichtenoffizier Kanalinseln/MNO Ki), the Naval commander of the Channel Islands (Seekommandant Kanalinseln/Seeko-Ki) and the generator plant, switchboards and fieldkitchen for the crew. The V142 has been restored and is a museum nowadays. You will get a good view of a communication bunker with all its original fittings. The M 172 (Seeko-Ki) which is linked to the V 142 by a five meters long corridor is used as a recording studio and can not be visited. The bunker for machinery is closed too. 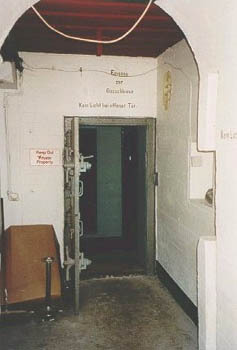 Inside the gas lock, looking to the room for machinery. Entrance to the M 172 via the corridor with several instructions on the walls. 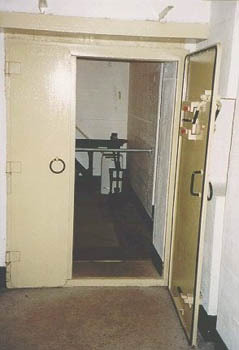 It is the same as an M 152 but instead of the observation room it has another entrance.